Let me say upfront that I adore stop-motion animation. I was raised on Aardman Studios and Robot Chicken, so I’ve always admired the dedication and patience of the makers of stop-motion animation. Sadly, because of the advancement of animation technology and how easy it is to do in comparison, stop-motion has become more and more of a rarity in film. But thank god Laika films (Coraline, Paranorman, The Boxtrolls) is prominent enough to not only keep making movies, but also keep getting better. 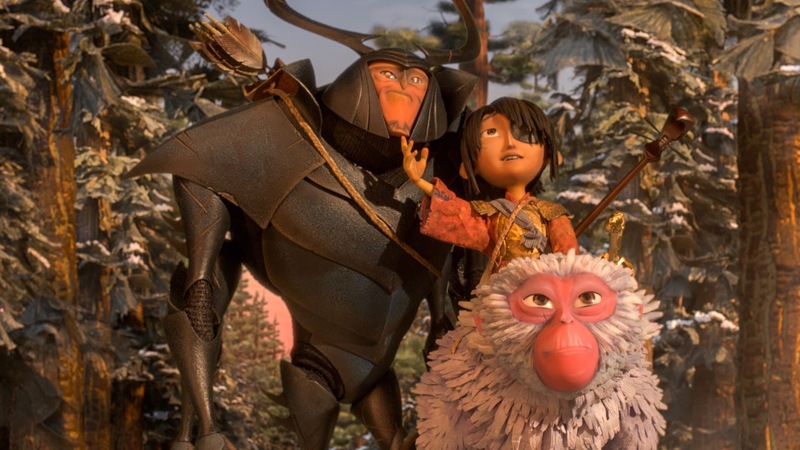 Kubo and the Two Strings follows its title character (Art Parkinson), a young boy living in ancient Japan with his mother, playing his magical Shamisen (a three-string guitar) that makes origami paper come to life and perform a story for crowds. It tells the story of Kubo’s father, Hanzo, a legendary samurai who fought great battles but Kubo has never known. It turns out that Kubo’s mother’s family, led by the Moon God Raiden (Ralph Fiennes) and his twin daughters (Rooney Mara), banished Kubo’s mother from the heavens after taking one of Kubo’s eyes as a baby. But the Sisters reach the human world to try to take Kubo’s other eye, so Kubo must look for three items that make up a magical piece of armor in order to fight Raiden. He won’t be alone thanks to the help of a fighting monkey (Charlize Theron) and a former student of Hanzo’s now cursed to appear as a giant beetle (Matthew McConaughey). 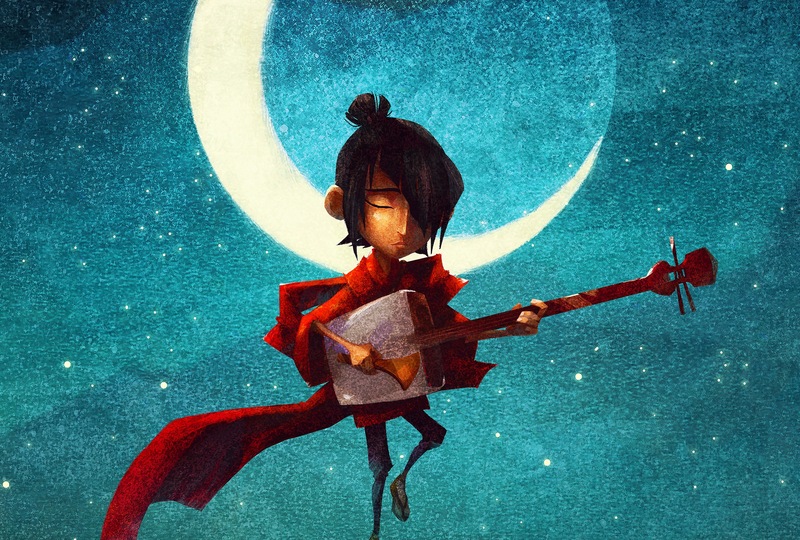 On a technical level alone, Kubo is Laika’s finest film to date. The detail and movement of the stop-motion is beautiful and astonishing. Everything from the action scenes to the origami coming to life to even the wind blowing water off the ocean waves is impressive. Since the film doesn’t take place in too many large cities and the need for set design didn’t need to be entirely detailed, the filmmakers took that as an opportunity to add more realism to the minimal world around Kubo. The film doesn’t use Japanese culture stereotypes, instead finds the core meanings of many modern traditions: dreams, family, imagination, and hope. On paper, it’s a fantasy adventure quest with family values (little hints of Indiana Jones thrown in). But the beauty of the animation (not to mention the gorgeous score by Dario Marianelli) makes it feels so much bigger, almost a bit spiritual. But even if that’s lost on the audience, the fun is front and center thanks to the voice cast. Art Parkinson isn’t playing the wimpy lost orphan, giving Kubo some genuine charisma along with heartfelt emotion. When he takes on the giant worm monster of the Moon King, it’s easy to believe his fearlessness. Theron well-served as Kubo’s Jiminey Cricket, equally effective in giving out wisdom and droll humor. McConaughey is pitch-perfect as the comedic sidekick, somewhat of a pseudo-riff on the macho hero of fantasy stories. Think Captain Qwark of Ratchet & Clank if his intentions were noble and he had amnesia. Kubo is certainly the most unique animated movie of the year (for kids at least, what with the release of Sausage Party). It’s not just for its great animation, but for a simple story with an inviting universe around it. Fun, free-spirited and open to all who see it despite its specific culture, Kubo is all about telling stories and legends like the right amount pizazz and heart. There’s no need to blink or worry about missing anything, just sit back and watch the wonder unravel. This entry was posted in movie, Movie Review and tagged animation, Kubo and the Two Strings, Laika. Coraline, movie, movie review, Paranorman, Sausage Party, stop-motion animation, The Boxtrolls. Bookmark the permalink.